We would like to inform you that as of the 10th of July until the end of September the Roda Golf Beach Club will reopen its doors with all its facilities. The Beach club boasts a swimming pool with jacuzzi, changing rooms, a “chill out” area with incredible views over the Mediterranean, food and drink, cocktails, direct access to the beach with water sports nearby. There will be a bus + ferry service available to make your day out more pleasurable and comfortable. It will depart from the golf car park and will circle the resort, taking you to Santiago de la Ribera where you will take the ferry to Puerto Tomás Maestre, and from there, a bus will transport you to the Beach Club. The total cost (return trip included) is 12 € per person. Please reserve on 968 147 353 or personally at the Club house Pro Shop to use this service. For additional information, enquiries or reservations, please, contact 968 147 353. Roda Golf Beach Club - The Video! We tried something new this month, and whilst we cannot claim to be professional video editors, we think it's been pretty successful! 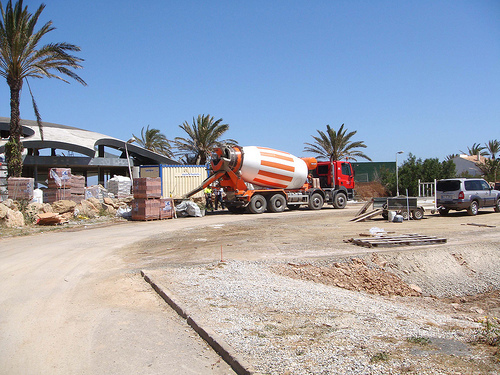 We wanted to convey just how busy things have got down at the Roda golf Beach Club which is due to open THIS MONTH! See you soon in the Roda Beach Club! Photo gallery is below this report! Hover over it for controls, click it for descriptions. Or go straight to the Flickr set for high resolution views! 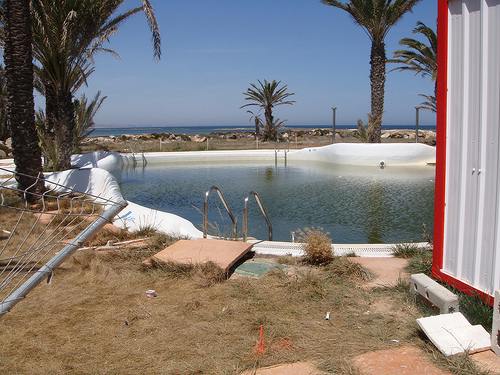 We have had a large number of requests for this report, with updated pictures from our regular visitors, who are growing increasingly fed up with the negative posts on a few "independent" forums out there about the beach club at Roda Golf. 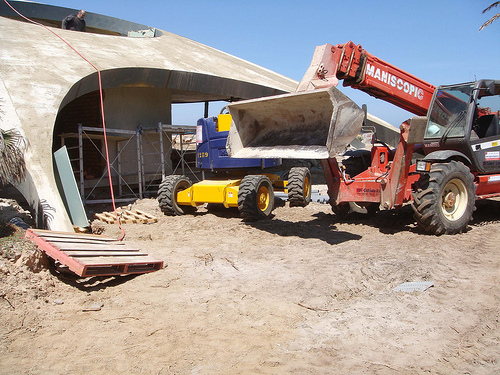 We visited the Roda Golf beach club on Friday 25th April and were very pleasantly surprised at the amount of work that has currently been completed, also the amount of work under construction, there were about 25 men working. Only a couple had decided it was too hot and were enjoying what looked like a well earned "siesta" under one of the beautiful palm trees! The Roda Golf and Beach Resort beach club is progressing nicely, the location is fantastic, for those of you who have not been lucky enough to visit the area, you are in for a very pleasant surprise. There was a massive amount of work to be done but due to owner pressure, the beach club was opened last year with a very limited service, it looked nice and was a pleasant alternative to the local beaches in Los Alcazares. However, for it to be considered a 5 star beach club, which is what you all want, the building needed to be taken back to the bare structure, well that has happened in the closed season. You must also remember that now that the new clubhouse has been completed and opened, with huge success I might add, (see our roda golf clubhouse post here) there are more men available for work on the beach club. There has been lots of new steel added, as well as a new floor for the upstairs. A number of internal walls have been removed, and all the area outside has been cleared. There are lots of building materials laying around, however they will all be used in due course. The beaches have been swept and all the beach debris has been removed, we actually watched a couple of trucks taking it away whilst we were there. The swimming pool has clearly been neglected, obviously as nobody has been using it for about 10 months, it looks like nobody has cleaned it in that time either, this pool will take just a week or 2 at most to be restored to it's former glory, but it has the potential to be spectacular, what with it being only 40 paces to the Mediterranean sea from the pool! We were lucky enough to meet some new owners who had just purchased this week, they were checking out the location and the planned facilities for the first time, Matt and Rachel and their 14 week old daughter Macy from Porthcawl, South Wales. They absolutely loved the place! Matt, who own his own magazine, "Seaside News", commented that even though the place was a mess, he could see the potential for one of the nicest facilities he has ever seen. Matt who loves to surf, and has travelled the world in pursuit of that elusive monster wave said, "the peace and quiet here, and the natural beauty of this area is just fantastic and we can't wait to use the beach club". Nice one Matt, thanks for your time. We hope you and the family had a safe trip home. In our opinion, this beach club is going to be awesome. We have always felt that, and if the new Roda Golf clubhouse is anything to go by, I think we will be right. The planned opening is the last week of June, which is when all the water parks in the area open, so nothing strange there. Be patient and get ready to be wowed, because even though there have been considerable delays, Calidona so far are exceeding everybody's expectations with the finished product. We hope you enjoy these most up to date photos of the beach club, please feel free to leave a comment or request any further information. Look out for our next news item coming soon, and remember, you can click the gallery for descriptions of each photo!